The PB80 screw compressor is a compact portable machine of a total weight of just 135 kg and has wheels so that it can be easily moved by one person. 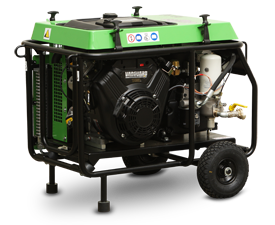 The air-end block is integrated, with no pressure container and is driven by a reliable BS petrol engine. The basic design produces 6 bar for driving jackhammers or smaller directional drills, 10 and 12 bar for special blasting work or blowing in optical fibres.